Happy Draw A Bird Day (July remix)! I decided to try a fanciful bird this time. 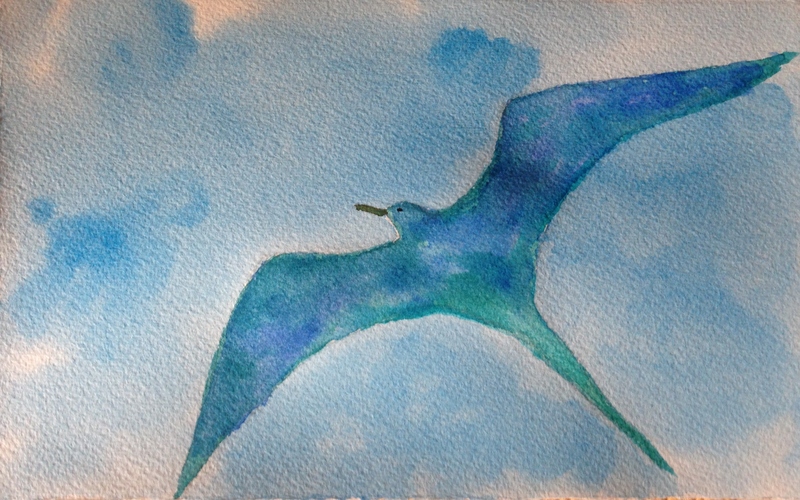 A sea bird with the ocean in its wings! I hope everyone enjoys the July edition of Draw A Bird Day. Fly, be free! Thanks, Debi! I appreciate it. The more realistic bird I was going to try bombed (the drawing) and I didn’t have time to correct it, so I decided to go a bit rogue lol. Wow! Took my breath away! Love the colors and movement and freedom this painting evoked. Thanks, Inari, I’m glad you enjoyed him. Your bird is very beautiful! Thank you, Sharon! Flying high is a sure way to beat the heat! A nice cooling breeze on this hot and humid day! Beautiful! Love how you created the ocean on it’s wings. It’s so peaceful ,yet so freeing. Thanks, Jill! I’ve never done an imaginary bird before, it was fun! I really like this! The blue clouds of mist are a nice touch! Ah, this is beautiful, Laura!!! You can see the vastness of the oceans in its wings!!! You also did a great job on the sky, again! Wonderful!!! Thanks for setting up this Draw A Bird Day thing, it´s so much fun!!! Fabulous Laura – beautiful gull as it soars free-spirited.